The best reason to buy an iPhone 6? The company already has "hundreds of millions of credit cards on file," thanks to iTunes and the App Store. And those worried about security may be comforted by the fact that Target, "which has to be paranoid about such things" following its own data breach, is "comfortable with Apple's approach." The system does appear easy to use: A phone owner simply touches her phone to a sensor while touching the phone's fingerprint detector, notes Laura Shin at Forbes. The company also offers what she calls "a new level of privacy," using changing codes rather than a single credit-card number for transactions. 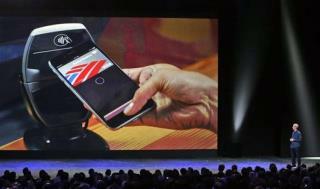 And finally, Apple, unlike other mobile-pay wannabes, isn't "trying to make money off the payment system. [It's] trying to increase the preference for their device," an analyst tells Forbes. Still, one hiccup could be the lack of stores ready to use the service. While some 220,000 are prepared to do so, "97.6% of business(es) do not have point-of-sale systems that work with near-field communication, the technology Apple Pay relies on," writes Jacob Davidson in Money. Apple can't even secure photos that were deleted 5 years ago. Last I checked, PayPal had tens of millions of users--not that that is any sort of endorsement for those jerks. Whether you like it or not, we are going cash free. People complain that a hacker might do this or do that, but we all used to sign our SIGNATURE on a receipt that had our name printed out and had our CREDIT CARD NUMBER completely spelled out...and leave it on the table for the waitress to pick up. There are far fewer hackers than dirty waiters. waitresses and busboys. Hackers are going to love this. Wireless transactions baby, easy money.